If you’re looking for a resource for information about goddesses why not go straight to the best, Patricia Monaghan? 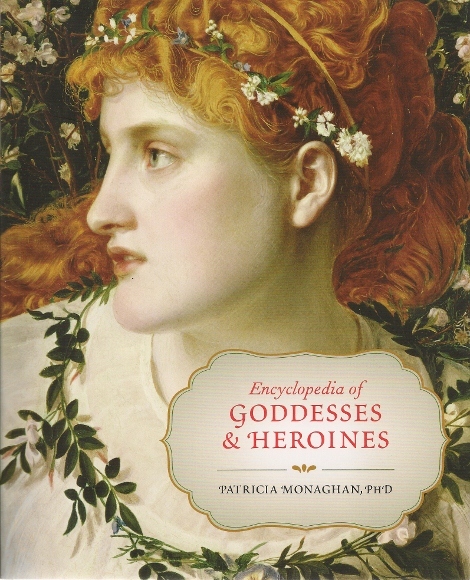 Monaghan published the first encyclopedia of divine females in 1979, and that book has stayed in print in one form or another right up to today with “Encyclopedia of Goddesses & Heroines”. The latest is newly expanded and features more than 1,000 heroines and goddesses from folklore, literature, and religion from around the world. The amount of information is dizzying. The “Encyclopedia” is broken up by region and country; South America and the Caribbean, Mesoamerica, North America, South Eastern Europe, Scandinavia, Rome, Greece, Celtic World, Pacific Island and Australia, Japan, Southeast Asia and Indonesia, India, Circumpolar North, China and Korea, Eastern Mediterranean, and Africa, and I’m sure I missed some! Do you know who Uti Hiata is? How about Ececheira? What about Pidari? They’re all pretty cool. I bet you’d find them interesting. You know a good way to learn about them? Yep. 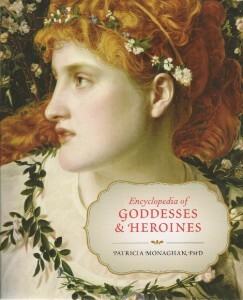 “Encyclopedia of Goddesses & Heroines”. The “Encyclopedia of Goddesses & Heroines” is an invaluable resource, written by an undeniable expert in the field.